On the morning of the last full day of my holiday I walked around the old town early(ish) in the morning taking pictures. Quite by accident I also found the town’s indoor market, so I took more pictures in there. I really enjoyed this couple of hours – I was using a small camera (Canon EOS 100D/SL1, for those interested, marketed as the world’s smallest DSLR) with a very small lens on it (24mm EF-S f2.8 pancake), and they makes for a small, efficient combination. Not having a zoom lens helps in that situation – just raise the camera to your eye, quickly compose and press the shutter. Here’s a link to a Picasa page with the full set. Before I left home I had done a lot of reading about trips from Chania, and one that definitely appealed was the walk down the Samaria Gorge. I even took a pair of walking shoes, despite the complications this added to packing. However, in the event I didn’t do it. So why was that? Well, there were various reasons. One was that it was hotter than I had expected it to be; at or slightly above 30º pretty much every day, and I began to question how sensible it was to do a long hike (see more detail below) in those conditions. 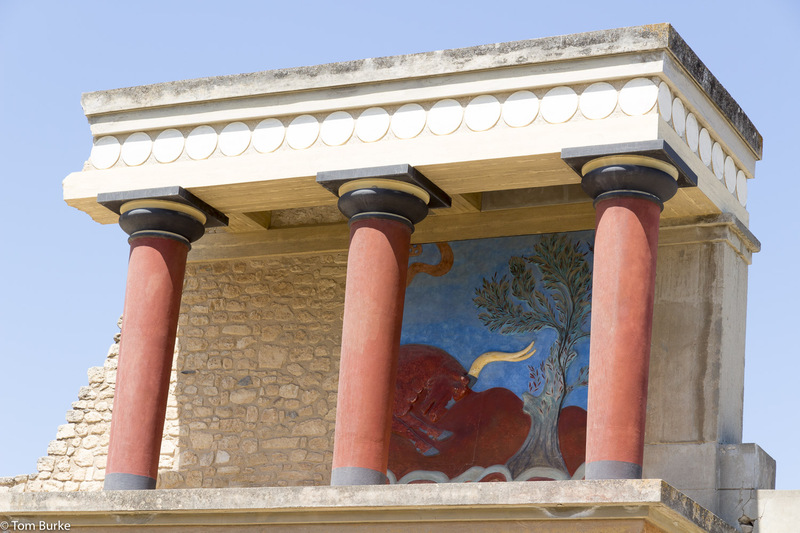 Secondly, my bout of tummy trouble rather interrupted the week’s schedule – certainly for first the day afterwards I felt very shaky, and even on the day after that I wouldn’t have been up to it (although I did enjoy the visit to Knossos that day). 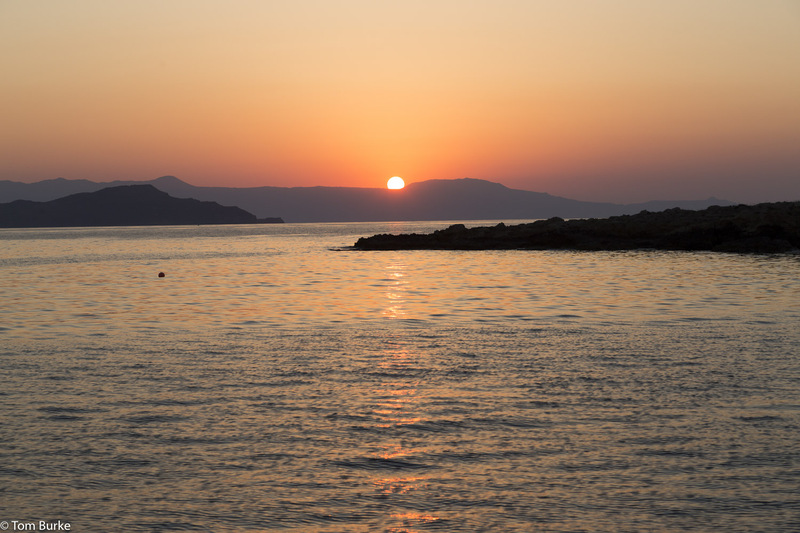 get the 18:30 bus back to Chania from Souga – that takes two hours or more. So the whole trip is over 12 hours. It’s also the case that once you’ve started, it’s best just to carry on. The gorge starts with a drop of 700 metres or so (from a starting height of about 1250 metres) within the first couple of kilometres so returning to the starting point will require a climb back up those 700 metres. This might be very tough given that the most likely reason why you’d be going back to the starting point is because you felt too ill to do the whole trip. On reflection, however, I think perhaps I let myself be a bit intimidated once I’d worked out what was involved. If I return, I’ll have a go at it. One possibility would be to get a late bus to Omalos (the village near the top) the evening before and stay there overnight, thus getting an early start down the gorge. Perhaps also the best time to do it would be in the early part of the holiday before the heat, the food and the alcohol have had too much effect! I did an excursion to Knossos on the last full day but one of the holiday. I think it cost me €18 or something like that, plus the entrance fee to the Knossos site which was another €10 or so for a ticket that covered the Knossos site plus the archeological museum in Heraklion. It was an early start – 7:30 from outside the Alpha Bank in the new part of Chania – and seeing as breakfast didn’t start until 7am the timings were a bit tight. As it happened I was still feeling quite wobbly from my bout of tummy trouble 24 hours or so earlier so I didn’t want too much breakfast anyway, which meant that I was indeed waiting for the coach by about 7:20. It arrived promptly and picked up other participants in the excursion as we went along (or sometimes just off) the road towards Heraklion. After about an hour or so we stopped for 20 minutes or so at a small café so we could all visit toilets and perhaps get breakfast; I was feeling quite hungry by this time (for the first time for 24 hours) and got myself something to eat. We arrived at Knossos at about 10:30 or so and had about just over an hour at the site. It’s hard to describe it. Like many archeological sites it’s difficult to understand, given that much of the site is just walls no more than a foot or so high. There are some places where buildings, or bits of buildings, have been reconstructed and they certainly seems impressive, but the fact is that the reconstructions (by Arthur Evans, the British archeologist who excavated the site) are very speculative and are themselves about 80 years old – by definition therefore they don’t incorporate any more recent understanding of the site. That said, I think it’s reasonable to view them as possible visions of how it could have been and appreciate them as such, while always remembering that they are speculative. For me the area I enjoyed most came at the end of the visit – the area around the Theatre and the steps around it. This isn’t a building, it’s an area of pavement and laid-out paths, and you can’t get them very wrong. It’s interesting looking down at a pavement that you know has been in position for about three and a half thousand years, maybe more. Then we drove into Heraklion for a quick visit to the Archaeological Museum. All of the big finds from Knossos are there, along with artefacts from the other ‘Palace’ sites, e.g. Phaistos, plus later classical period artefacts. The scheduled visit was due to last for an hour after which there was about 90 minutes of free time, so I just dropped off the back of the group and took my time in the museum. The artefacts were impressive, especially the frescoes, but I found myself struck by simple objects – some pouring jugs, and above all, some small cups, painted and with handles, that wouldn’t look too much out of place on my kitchen table. Nearly four thousand years ago, a potter came up with a solution to the problem of how to bring a drink up to your lips that we haven’t really improved upon. There was also a café in the museum where i was able to get a tuna baguette which it turned was just what my stomach wanted. Back on the coach at about 2:45 I discovered that the day included a short visit to Rethymno on the way back. Given that I’d spent a day at Rethymno previously on the holiday this wasn’t great news, but never mind. So we were dropped off by the harbour and looked at that, then crocodiled down to the Venetian fountain in Rethymno old town. It turned out that we then had about 30 minutes or so free time before the coach left so I dropped into Cul de Sac bar just by the fountain and spent the time there getting myself round a bottle of sparkling mineral water. Then it was back to the coach for the drive along the old coast road to Chania which we reached at about 6:15. All in all, a good day, and I was pleased that I actually felt better at the end of it than I had at the beginning. Unfortunately, I had a very bad 24 hours following the Sunset cruise. Earlier that day I’d had a helping of baclava and ice-cream, and come bed time I was definitely feeling not well. During the night I was quite bad with a very upset tummy; in fact, at one point I was so depressed that I started investigating early flights home. However I had a chat with Val the following morning and she gave me a good pep talk, as a result of which I went to a pharmacy and got some pills (Immodium, in fact, in Greek packaging) and felt a bit better thereafter. But that day I ate very carefully and plainly, drank only sparking mineral and other bottled water, and no alcohol. I did a 1 hour ‘Sunset Cruise’ from the harbour one evening. It was in an old boat, just out of the harbour for 15 or 20 minutes to a picturesque spot a few miles along the coast where we stopped, a couple of people swam and snorkelled, refreshments (fruit and raki) were produced, and then we sailed back. And on the way back I got some pictures of a Cretan sunset. That’s it, really – it was an enjoyable way to spend an hour. Here are a few images. Btw, I learned after the couple in the water came back on board that she couldn’t actually swim….. I spent a day in Rethymno during my holiday. In some respects it’s like a smaller version of Chania – Venetian harbour, Old Town, new town behind it. However there were some differences. I went there on a public bus. They ran every hour from the bus station in the modern part of Chania, the journey took about an hour and the fare was €6.20 each way. The bus was actually a coach with effective air-conditioning (the outside temperature in mid-afternoon was just over 30º) and was comfortable and clean. Best of all there were few tourists on it – the great majority of passengers were Greeks, and local Greeks at that. In the end I wasn’t sure what to make of Rethymno. At one point I had nearly booked a hotel there rather than in Chania because there were ferries from Rethymno to Santorini and other islands – there are none from Chania – but I decided to stick with Chania because it was much closer to the airport; however, I had been wondering if I had made the right decision. After spending most of a day in Rethymno I decided that I had. Some parts of Rethymno were very attractive, but it was all rather smaller-scale that Chania – not surprisingly, as the population is about half that of Chania’s. This meant that the Old Town especially was smaller and was less well separated from the modern town. One of the things I liked about Chania was that Old Town was big enough to comprehensively surround the harbour and to be several lanes deep, and there’s no vehicular traffic along the lanes – they’re pedestrian only. 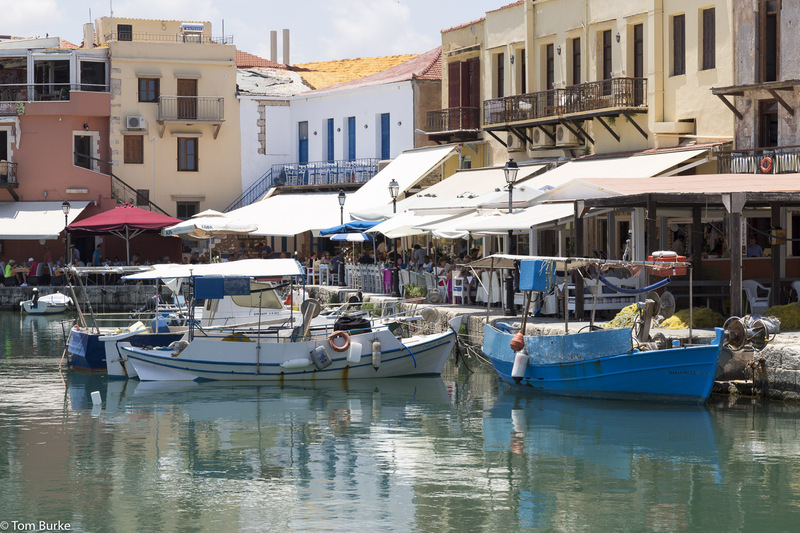 In Rethymno, however, a number of the streets in the Old Town had traffic along them, and this made for less relaxing and immersive experience – you could never just wander, you had to be constantly watching for the traffic. The harbour was also smaller, especially the old harbour, but was nonetheless attractive. I’m having a week in Greece – specifically, in Chania on Crete. I flew out on a very early flight on Tuesday morning – 6:25 from Manchester, which in turn necessitated a stay at a hotel at Manchester Airport the night before, and even then, a 4am start to the day. And after all that the flight was 30 minutes late leaving. It’s almost four hours to Crete and what with the time change it was two o’clock local time when I eventually checked into my small hotel, El Greco. It’s very small and so are the rooms, and it only does breakfasts, no other meals. That’s not a hardship as you can’t move along along the harbour front or in the lanes of the old town without falling into a bar/restaurant. Actually, the main problem is to stop yourself being physically dragged into them by the at times over-enthusiastic greeters. Anyway, I spent the afternoon walking around the harbour and the old town, stopping at one point to have a lunch of meat balls with cheese in a tomato sauce which was very tasty. I had to spend some time later sorting out the air-con in my room – it’s tied to the general electrical supply to the room which is only ‘on’ when you’ve put your magnetic room key into the relevant slot, which means that during the time i’m out the air-con is off. But having persuaded it to aim for a lower temperature I was able to reduce the heat in the room. Overnight I just left it on, and in fact slept well. I ate dinner at a small cafe in the back street just outside the hotel, and had a pork stifado (a goulash). Very tasty; but they served it with fries! Maybe experience has taught them that’s what tourists want. Then it was more walking around the old town and harbour and then to bed. This morning (Wednesday) I have had a purpose. First I went out and took some photos with the camera on the new light-weight travel tripod, and after that I explored the new town. I was specifically looking for ways of getting to other places, which given that I haven’t hired a car means the bus. After a deal of walking and enquiring I found the main public bus station, which actually looks efficient enough. I hope to go to Rethymnon tomorrow. Now it’s nearly lunchtime, but before that I shall visit the local maritime museum.